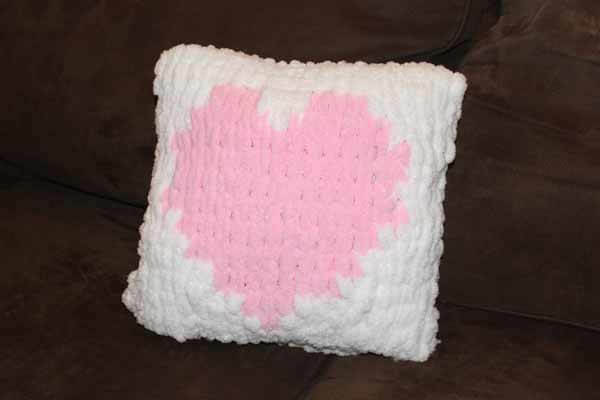 Learn how to make this cute heart pillow with our new loop yarn pattern and loop yarn. This video and photo tutorial will give you step-by-step instructions. We also have other loop yarn tutorials, so click that link if you need more instructions. 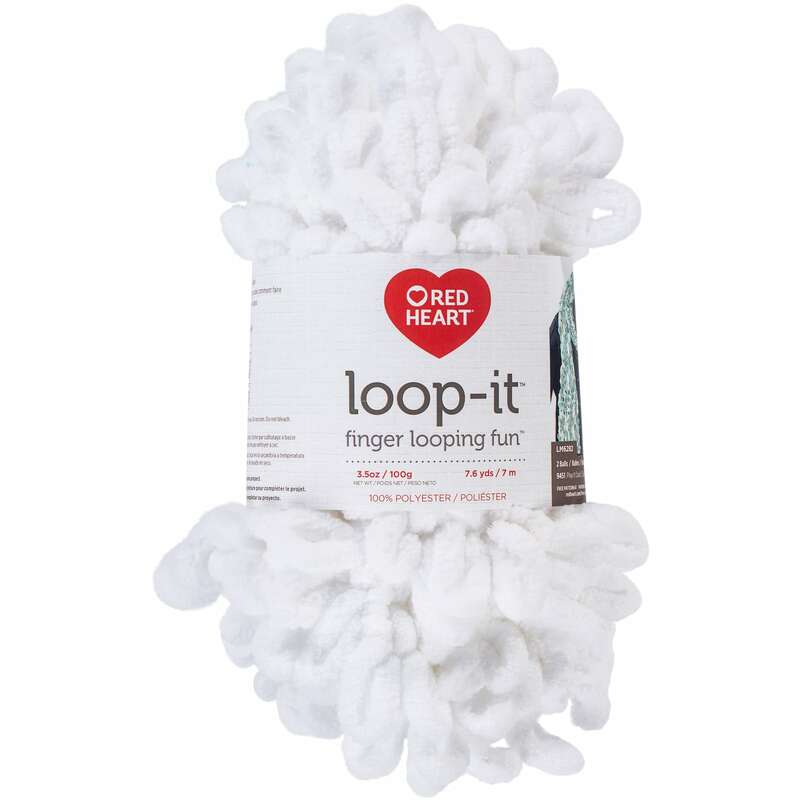 I LOVE the Red Heart Loop-It Yarn as it's so soft and fun to work with. There are many different styles/brands of looped yarn and colors. 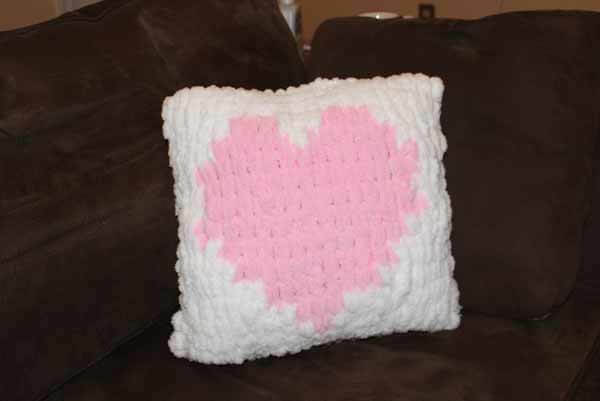 You should be able to find one you love and make a cute pillow! We were not sponsored or compensated for this post by any manufacturer. Also, look below for places to purchase the Red Heart Loop-It Yarn and for a download to the pattern we used for the pillow. By purchasing items through our links, we get a small commission and you help us to keep making more videos. Thanks in advance for your purchase! Click the photo below to watch the video tutorial, or keep reading! Watch our Video Below or Click the link to watch Learn to make a Heart Pillow (Loop Yarn Project) in Youtube. The pillow will be made to fit a 14" pillow form. If you would like a larger pillow, you can add more loops on each side. 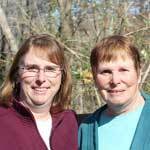 Scroll down to the end of this article for the pattern you need for this project. The download is a FREE PDF pattern. I made this pattern using the Craft Designs Online site which you can find on our pattern generator page. For the 14" pillow, 21 loops covers the pillow. I used an odd number of loops so that the middle of the heart will be in the center. Count out 21 loops from your background loop yarn color (mine is white). This pillow uses all stocking stitches. A stocking stitch with looped yarn is made by taking the next loop in your working yarn and putting it through the previous stitch/loop from back to front and pulling up. 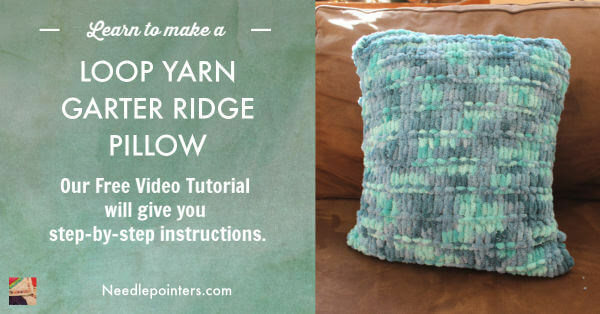 We have a complete video tutorial on the loop yarn stocking stitch if you need a refresher. So working back across the foundation loops, take the next loop in your working yarn and pass it through from back to front. Continue with the next loop in the working yarn and the next loop in the foundation loop chain. Work your way all the way across. Make 3 rows with all white (background color) working back and forth across the rows making stocking stitches. Once you have these rows stitched, hold it up against your pillow form to make sure you will have enough to cover it. It's much easier to go back now and add or remove rows than after you've finished the whole heart! Make adjustments if necessary. The fourth row starts the heart. Stitch across 10 stitches to get to the first PINK (heart) stitch. The heart stitches will also be made with stocking stitches so the stitch does not change. When you join in another color with the looped yarn, always join the color in one stitch early putting the color behind the main color. So, the main color is always in the front and the joined color is in the back. So, join the PINK on the 10th stitch by inserting both a WHITE and PINK loop through the 10th loop at the same time (PINK behind WHITE). Next, place the PINK in front and loop both the PINK and ?WHITE through the next loop (11th loop) with the WHITE behind the PINK. Then, switch back to the WHITE in front and PINK in back and loop through the 12th loop. The PINK yarn will be dropped now until the next row. Continue finishing the row with the WHITE. Your row should look like the photo above with one pink loop in the center. Row 5 continues in the same way as the previous row. This time stitch 9 loops in WHITE. Loop the PINK in behind the WHITE on the 9th loop. Remember we always overlap the new color by one loop. Stitch the next three stitches with the PINK in front. Since it's only 3 stitches, you can loop the WHITE yarn in behind the PINK on each of the 3 stitches. On the next stitch, move the WHITE to the front and PINK behind and loop in the PINK. Drop the PINK and finish the row with the last 8 stitches in WHITE. Continue rows 6 - 14 in the same manner. Starting with Row 6, cut the WHITE yarn after starting the PINK. I usually leave one or two extra loops before cutting. 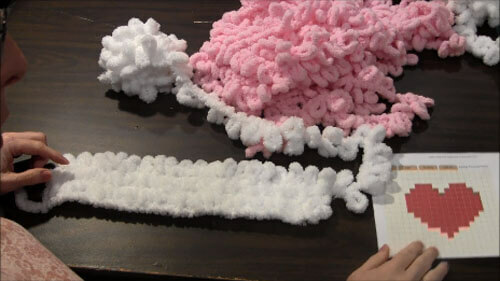 Alternatively, you can use two pieces of WHITE yarn and just drop the WHITE on the one side. In this case, work with a different piece of WHITE yarn on the other side. This way you won't need to drop and cut it on each row. Follow the pattern and stitch the remainder of the heart. Once you finish row 14, continue stitching with just the WHITE yarn for the remainder of the rows for the front. When you are finished with the rows of the front, check to make sure the pillow will cover the front of your pillow form (if you are using one). If necessary, add more rows. Continue stitching WHITE rows until you have enough rows to cover the front and back of the pillow form. If you have left extra loops on the back of your pillow, you can cut them off now. I still leave one loop and cut off any extra ones. The loops will be on the inside of the pillow so they will not be seen. If you want, you can cut the loops open and then weave in the yarn ends to have a more finished look on the back. I was a bit lazy since this is a pillow and you won't be able to see the loops on the inside. So, I just left the loops. It's up to you! Next join the front and the back together at the one side. Fold the pillow with wrong sides together so that the first row (foundation chain loops) and the last set of loops are together. Take the loops from your last row and put them through the foundation row one at a time. You should have the same number of loops as foundation row stitches so they will match up. You will have the pillow joined together as shown in the photo above. Bind off the row by taking the 2nd loop and passing it through the first loop and pull. Then take the 3rd loop and pass it through the 2nd loop. Continue across the row. 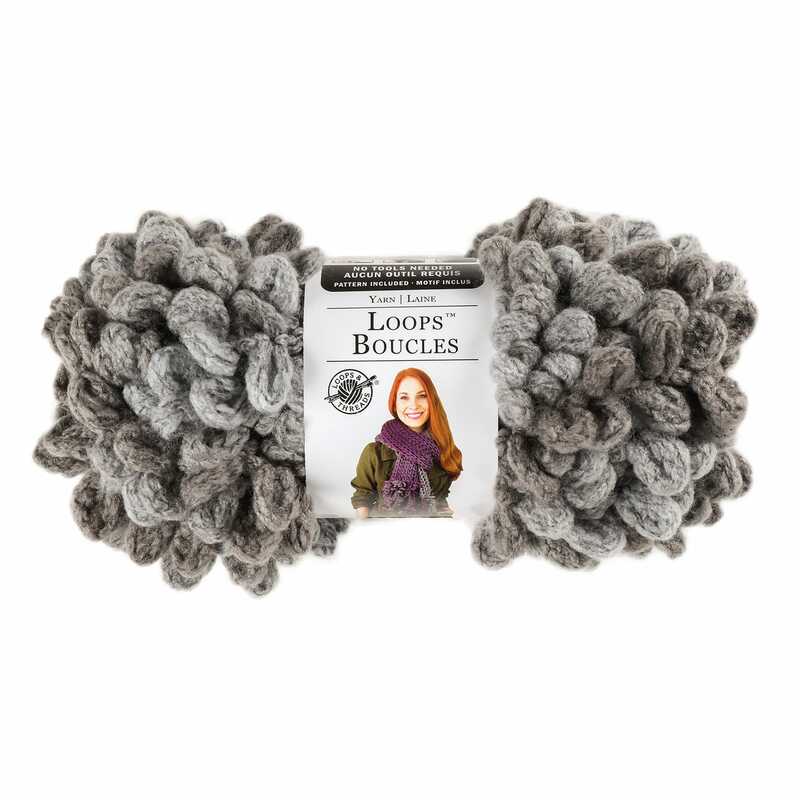 If you need more detailed instructions on the Loop Yarn Bind off, click the link. When you get to the end of the row, clip the last loop open and tie it off. Tuck the ends inside the pillow or weave in. To finish the sides, take a piece of the white yarn and clip the loops open so you have one long piece of yarn. Tie this piece of yarn to the one corner. Matching up the rows in the side of the pillow, wrap the piece of yarn around and around the loops. Go through the loop then wrap around the edge and back through the next loops. When you get to the end, tie it off. Insert the pillow form into the pillow. Make sure to get the corners into the corners of your heart cover correctly. 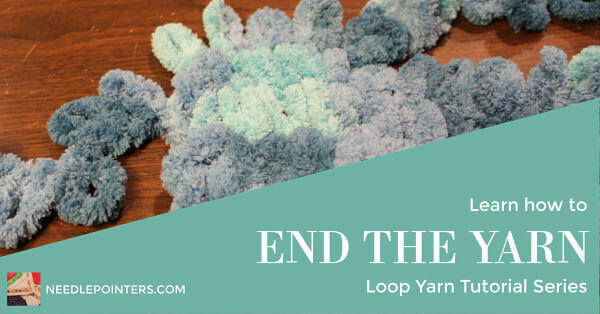 Take another long piece of yarn with the loops cut and finish the last side. The loop yarn heart pillow is finished. 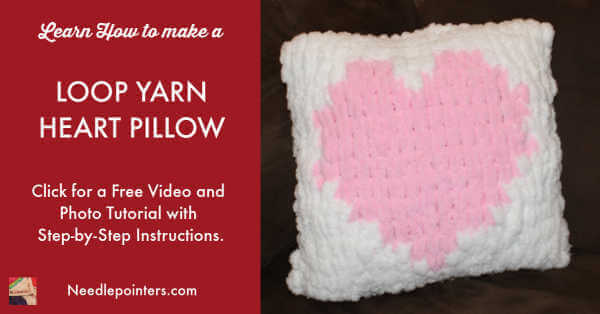 We hope you enjoyed this tutorial and make a loop yarn heart pillow for yourself. Some other loop yarn tutorials that may be of interest are below.